Here's a novelty. 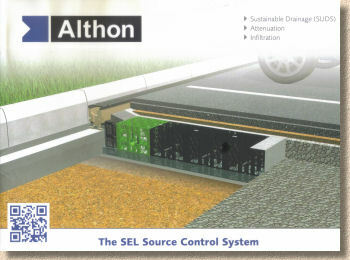 Instead of the more usual reviews of paving brochures/catalogues/collections/portfolios (delete as appropriate), this week we have a drainage products brochure, courtesy of the people at Norwich-based Althon. Looking back at the index of news items, drainage has rarely featured, with the main reason being that drainage brochures do tend to be little more than a list of products and all a touch on the dry side, no pun intended. 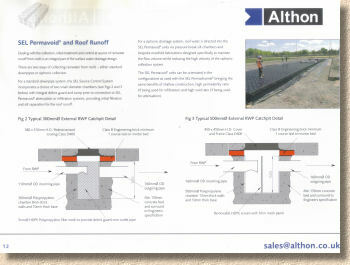 Anyway, Althon produce a range of specialist drainage items, from pre-cast headwalls to high-capacity linear channels, but what they've sent for our perusal is their literature for the SEL Source Control System, which is a whole SUDS chain in one package, and a smaller brochure for the Skeletank, which is a storm crate targeted at the residential market. So, starting with the SEL System, this is probably best thought of as a sequence or chain of compatible products that enable Source Control, the holy grail of SUDS, which aims to deal with surface water at source, that is, where it lands, rather than sending it through pipes and sewers to be dumped somewhere else, usually an already-overflowing stream or river. The SEL System incorporates a number of stages that can clean, attenuate and/or infiltrate as deemed necessary, and the whole process is carefully explained in this cracking little A4 landscape brochure. It all starts off with an explanation of just what is SUDS. You'd think that everyone in the trade would have grasped this concept by now, but it still seems to faze many designers and installers who simply can't resist the urge to send water into pipes and let it all magically disappear from their responsibility. Just in case you don't know, SUDS is all about dealing with surface water in a more sensible way, trying to replicate the natural process whereby precipitation (rain and snow, etc.) finds its own way into the ground from where it very gradually finds its way to the streams and rivers. Along the way, it re-charges depleted aquifers and water tables, reduces society's reliance on big sewers and eliminates the mega-pulse of surface water that was traditionally sloshed into our watercourses within minutes of the rain starting. It's sustainable. That's the whole point! There are all sorts of ways and means of achieving this, and the SEL System is one of the most complete, offering products and technologies to make each and every stage simpler to install and easier to maintain, as well as cleaning the water as it progresses through the system. It starts with PermaChannel, which collects the run-off from paved areas while providing oil separation and sediment deposition. This is followed by the PermaFilter, which is, as the name suggests, a filter to intercept any remaining hydrocarbons and break them down using biological means (a so-called BioMat). Next comes PermaVoid, which is a shallow attenuation module (storm crate) designed to store and gradually return water to the ground beneath. The whole lot can be supplemented with the Sump Chamber which further intercepts sediment and silt, and enables access for monitoring and maintenance, and finally there is the PermaCeptor, which is a barrier mechanism for isolating sensitive sites, such as oil storage compounds or industrial sites, and ensuring none of their mucky run-off can get into vulnerable aquifers or watercourses. Not all stages will be necessary on every project. The PermaVoid is the item most likely to be seen and used. It's perfectly possible to install the PermaVoid crates as a standalone SUDS, using them to create, say, a simple soakaway. Its shallow profile lends itself particularly well to creating a soakaway beneath a paved area on confined sites where space is at a premium or where there simply isn't room for a more conventional garden-based soakaway. Rather than go into great detail about how each component of the SEL System can be used, have a look at the brochure for yourself. It is a genuinely easy-to-follow guide to SUDS, where everything is explained in simple language, highlighting the benefits that SUDS brings to everyone from installer to homeowners, and the whole lot is generously illustrated with first-rate diagrams which bring all that technology to life. There are examples of how, for instance, a roof run-off might be handled, or how a large car park can be drained. It's all deceptively simple and that simplicity really does shine through in this excellent booklet. The Skeletank product takes the storm crate concept and makes it much more user-friendly. 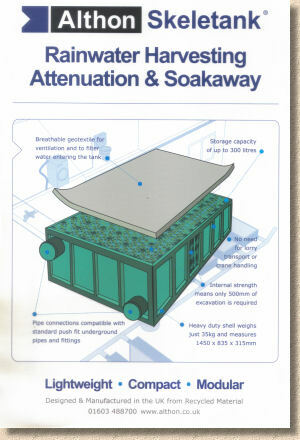 In principle, Skeletank is a modular crate that can be used for either attenuation/infiltration as a soakaway, or for rainwater harvesting, a topic that has been attracting much interest during the current hosepipe ban affecting parts of Lower Britain. Like the previously mentioned PermaVoid crates, the Skeletank units are shallow, just 315mm deep, and so need minimal excavation, and they are very light, with each crate weighing-in at a manageable 35kg. Even better, they are made from recycled material, so they are just about as green as it's possible to be! Pipe connections are simple push-fit affairs, and consequently installation is incredibly simple. Again, it's a system that can be installed beneath a paved area, if necessary, as its internal structure has been designed to maximise strength while not compromising void space. To be brutally honest, the A4 eight page booklet isn't as pretty as that for the SEL System, but it does a good job of explaining the product and its potential usage. 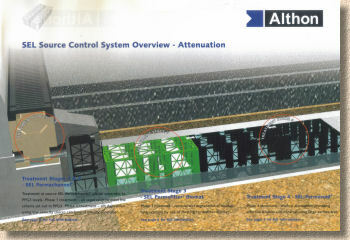 It relies mostly on diagrams and it has to be said that a photo or two of the actual Skeletank units in close-up would have been beneficial in allowing potential users to better understand the product. If I were coming to this as a complete novice, I might be confused as to just how the same leaky box could be used to either store water or return it to the ground. Is it really as simple as standing it on end to turn it from storage to soakaway? It's a sad and disappointing fact that too few driveway and patio contractors understand SUDS or the use of storm crates. All too often, I encounter an overflowing run of linear channels with the end-cap left off as some half-hearted attempt at allowing water to seep into the ground. Another popular 'solution' is the big hole back-filled with any old crap that happened to be lying around, such as block off-cuts, broken flags, house bricks and the inevitable empty cement bags, which is then claimed to be a soakaway. SUDS in general, and storm crates in particular, are incredibly simple to understand and to install. If you've ever though that you really ought to get your head around this whole SUDS and soakaways thing, then these two booklets from Althon are the ideal introduction.